Still using up that ham! Also, I had some sweet potatoes that were begging me on their little yammy knees to be made into gnocchi. I could I say no? People, you need to pay attention to this recipe. I don't put up anything on this blog that tastes bad (unless it's hilarious), but this meal is ESPECIALLY delicious. Just sayin'. You might have gleened the tastiness factor from the fact that it contains cheese, butter, ham and nuts, but I just wanted to make sure you understood. Yum. Prick potatoes with a fork and microwave until fully cooked and soft...about 10 minutes (turning once). Cut potatoes in half and let cool. Scoop out the insides and mash them well in a bowl. Add ricotta and blend well. Add the Parmesan, nutmeg, salt and brown sugar and mix well. Add the flour, 1/2 cup at a time until a soft dough forms. Separate the dough into 4 pieces, and one at a time on a floured surface, roll each piece into a long rope, about 1 inch thick. Cut the rope into bite-size dumplings and gently roll each dumpling on the back of a fork (dip fork in flour to avoid sticking) to make ridges. Set formed gnocchi onto a sheet pan lined with parchment and repeat with the rest of the dough. Set aside about 20 of the gnocchi for this recipe, and freeze the rest on the sheet pans for at least 1 hour before transferring them to freezer bags. Bring a pot of water to a boil and salt it generously. In a couple batches, cook the gnocchi in the boiling water for about 5 minutes. Drain, and set aside. Heat olive oil in a skillet with garlic. Cook until the garlic starts to soften. Add butter, sage, ham and walnuts, and cook until the whole sage leaves are crispy and the ham is starting to brown. Add gnocchi and gently toss to coat, then heat through. Season and serve. I am thinking that this is the perfect meal and that Jeff would beg for it on his hands and knees. I think... I will have to make it! Wow-- this looks awesome. 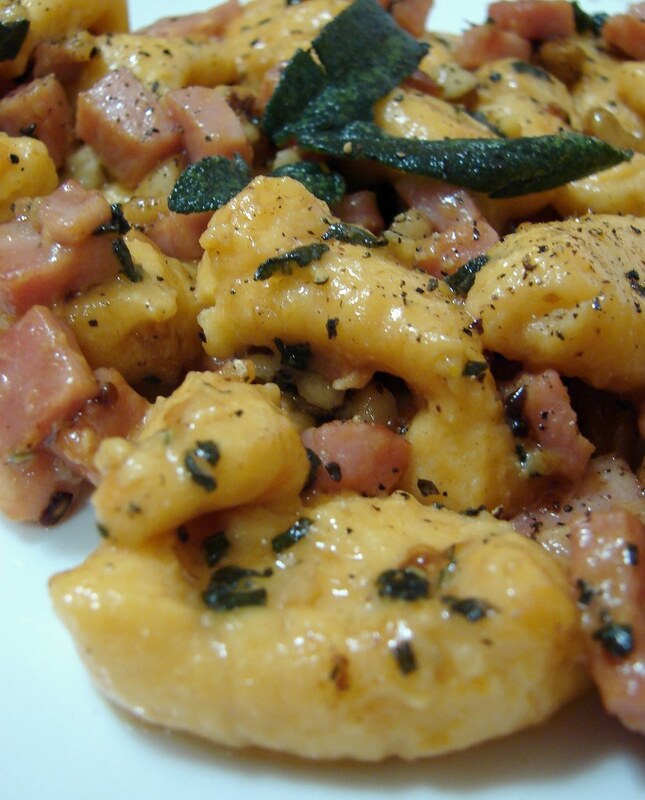 Sweet potato gnocchi with sage and butter .. unbelievably fantastic combo!! Nuts and ham to boot. Mouthwatering. IronStef, you're killin' me here. There should be a law against perusing the gawk at lunchtime. Of course I'd be the first to break it. :-) Man oh man, now I have to whip up these gnocchi. 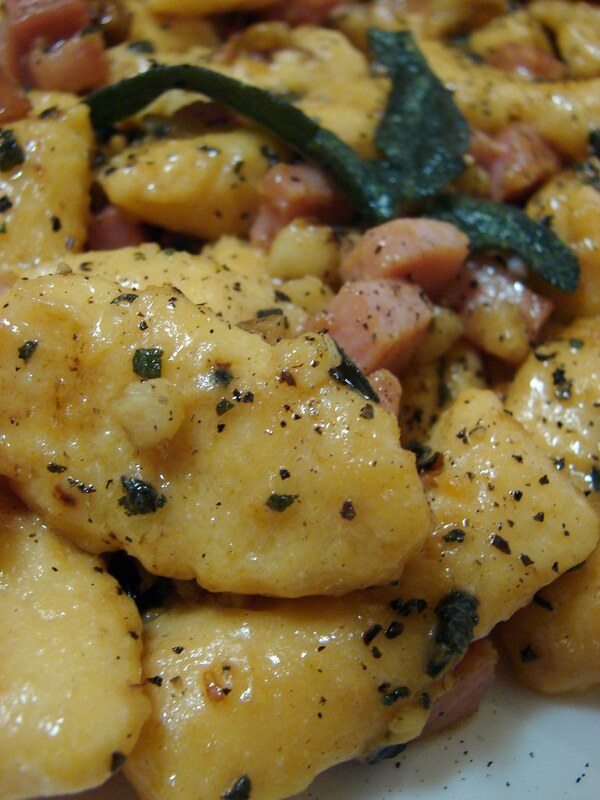 These look delicious--I'm intimidated by gnocchi, though. Every time I watch Top Chef, someone's being yelled at for their gnocchi being too dense. But I love gnocchi enough that I might have to get over my fear. Wow...my Nonna the traditional Italian cook is turning over in her grave....BUT I gotta try this. Hey... I am going through blogger and visiting everyone who listed bacon as an "interest". Gotta love folks who think fatty strips of pork are akin to a hobby. And I'm in St. Louis. Come visit my blog sometime....and I will be back. This sounds delicious! I think I may have to try this one! I just made this to serve with Thanksgiving dinner tonight (sans the walnuts, because my father-in-law is allergic). I tasted a little bite and man is it amazing. Thanks for sharing! What happened. Followed recipe. Gnocci became gelatinous mess in water. Cooked the next batch less than added to fry pan. That batch broke down in pan with ham. Etc. should there be an egg added to gnocci recipe? Definitely think there should be an egg added. Otherwise, great flavor combination!